The power of recogitnion is a story being shared on today’s Corrie Lo Show. Imagine you’ve hit legitimate rockstar status by the age of 21. You’re listed under acts like the Cure on major music festivals and your fans really love to hear you play. However, being heard isn’t the same as feeling seen. So you drown down your sorrows deep into the rockstar lifestyle, only to find yourself addicted, overweight, and eventually suicidal. So how exactly do you start over when you’ve already reached the top? 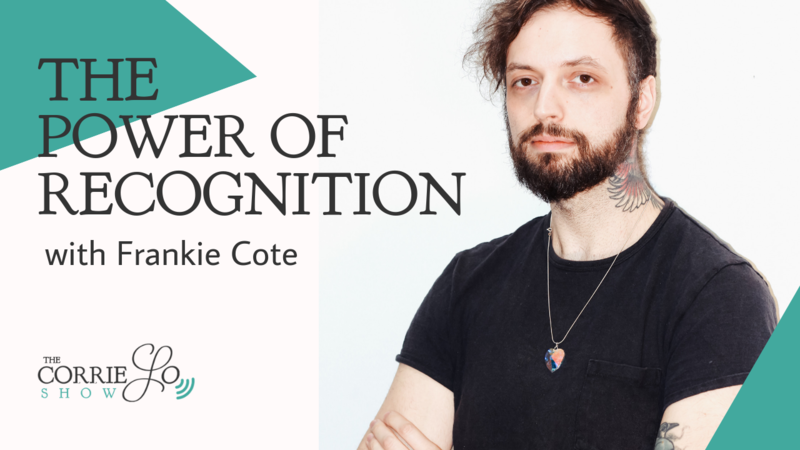 This is what today’s guest, Frankie Cote has done multiple times in his life, and today he’s going to share how he did it. If you’ve achieved great success but still feel completely empty and unfulfilled, this episode is for you. By the end of our conversation, you’ll understand the difference between being heard and feeling seen, identifying your rock bottom (pun not intended, or is it? ), and that it’s ok to start over as many times as it takes until you get things “just right”. 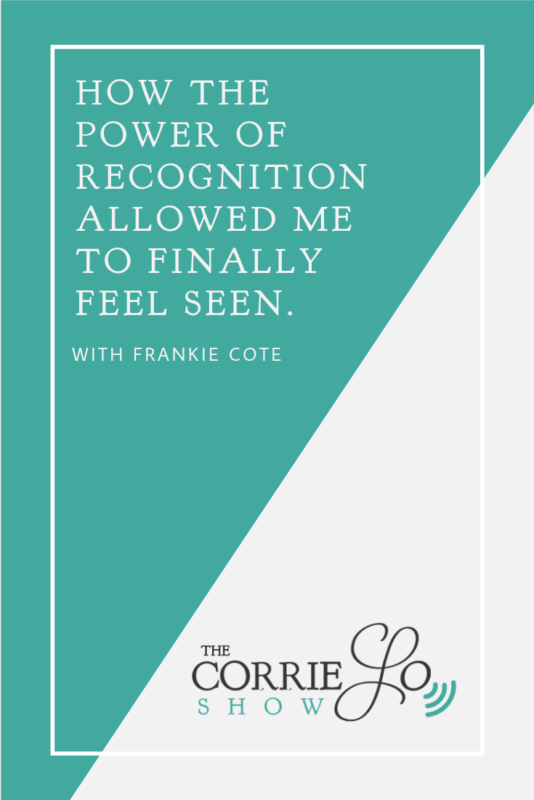 Frankie Cote is an Amazon Bestselling Author and the Founder of BE INFINITY, a life coaching business that helps its clients find the peace and self-love needed to take their lives to the next level. Frankie once weighed 320lbs, drank a bottle of whiskey every day, lived with chronic depression and an anxiety disorder and tried to kill himself twice. Having faced his demons and escaped the major rut he was in, he now spends his days helping others do the same. What do you think of Frankie’s “radio” voice? This entry was posted in The Corrie Lo Show and tagged #whosyourogo, appreciation, award, baseball, coaching (industry), david novak, emotional intelligence, employee engagement, employee recognition, employee recognition ideas, english, human resources, inspirational, leadership, mlm, motivational, network marketing, ogo, oh great one!, power of recognition, recognition, recognition meaning, recognition quotes, rewards, success, ted, ted talk, ted talks, ted x, tedx, tedx talk, tedx talks, tedxbellevue, the power of recognition, u betta recognize, usa. It is a good conversation..Good being ..Good thinking..to motivational transformation from near to death to getting new life..for peace we search ..search..we search..but we don’t find really where is..what is the form..which way we get..Really it is in the mind of person..I.e self realization.. self motivation..self attitude..self control..over all we love first we self..automatically we get peace not only in mind but also outside . Where you go..a good motivational and transformation words I listened after a long time..this programme really transform the people..what is way to get peace..and also giving the motivational transformation with real experiences of the persons. I’m so happy to hear you not only enjoyed the conversation but got a lot out of it. One of the reasons I like to feature these interviews is so viewers/listeners can hear how people overcame their challenges and the resources and tools they used to do so. Thanks for taking the time to comment.